Treasure Data provides a plug and play analytics infrastructure, hosted on AWS, so that you can focus on business value not infrastructure. Built with flexibility and security in mind, Treasure Data collects, stores and analyzes all your data leveraging our 300+ integrations and will seamlessly connect with Amazon Redshift. With Treasure Data + Redshift, you can go from ingestion to insights in under 30 minutes. 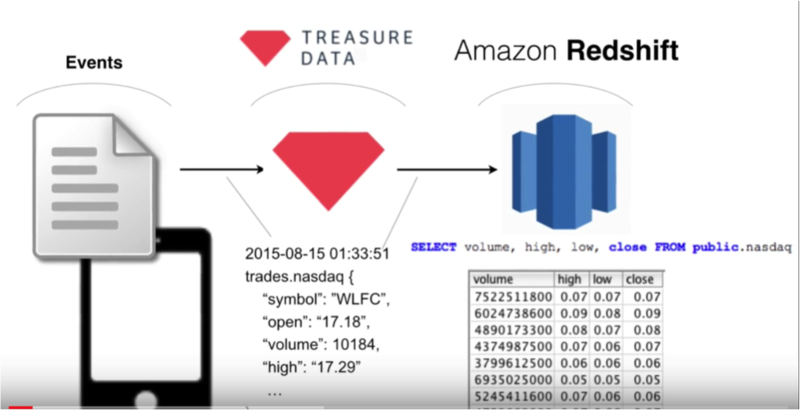 At Treasure Data, we transform, enrich, and load your data directly into Amazon Redshift. Leading companies such as MUJI, Pebble and ClassDojo use Treasure Data alongside Amazon Redshift to power their data driven insights and analysis. “We’ve been very happy with Treasure Data’s Redshift connector. It allows us to make the best use of Redshift’s capabilities.” – Adrian Gilgor, CTO, Mobfox. Schedule a custom demo today!